Wow! 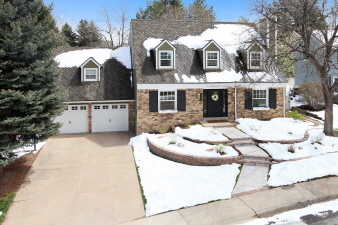 This home has it all and has been through 6 figure renovation! Cool Cape Cod w/ major curb appeal & lots of extras! Cherry Creek schools including Homestead Elementary (#11 in the Nation!). New roof 2012. James Hardie Siding. Radon Mitigation. Brand new professional landscaping front and back w/ fence. Interior boasts Pella & Marvin high end windows. Solid maple custom wood and mill work. Solid wood 6 panel doors. High end Crystal cabinets with extended pantries, shelving, gorgeous granite counters, & stainless appliances. Master boasts a huge oversized custom closet you have to see to believe. Basement finish super cool & kid friendly complete w/ slide, under stair playhouse, great room, mini curtained stage, oversized bed, very nice 3/4 bath plus extra storage/utility room. Covered patio with built in gas grill. Balcony. Super cute storage shed matches home. Great Community with multiple tennis courts, 3 swimming pools, walking trails, greenbelts and open space! Why would you ever pay more?